A man is seated on a chair at a computer display and keyboard. A woman stands behind him, resting her hand on the back of his chair and looking over his shoulder. Woman: Is that your macho OS with the “man” command? Man: Just for you, I added a “woman” command. An SSH(1) man page is seen, with flowers drawn on it. It includes a page header "GENERAL COMMANDS." Also included is the man page section NAME with its content "Ssh - OpenSSH SSH client (remote login program)." Also included is the man page section SYNOPSIS with its partial ontents "Ssh [-1246AaCfgKkMNnqsTtVvXxYy] [-b bind_address]." 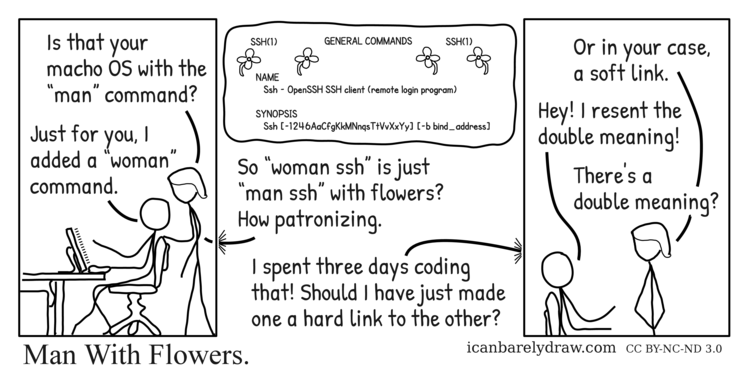 Woman: So “woman ssh” is just “man ssh” with flowers? How patronizing. Man: I spent three days coding that! Should I have just made one a hard link to the other? Woman: Or in your case, a soft link. Man: Hey! I resent the double meaning! Woman: There's a double meaning?